As seen on PBS, An Irish Christmas is said to bring just about everything to the table – joy, hope, laughter, friendship, celebration, of life through storytelling, music, song, and dance in a night that sparkles with life and a bit of ‘magic!’. The journey of Christmas in Ireland will play Pikes Peak Center, December 1. 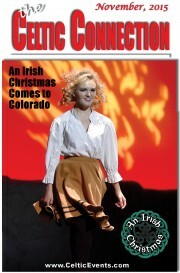 Tickets to An Irish Christmas, December 1, may be purchased online at www.PikesPeakCenter.com, all TicketsWest locations by dialing 520-SHOW, or by visiting the Broadmoor World Arena or Pikes Peak Center Box Offices. Pre-event dinners in the elegant ANB room at the Pikes Peak Center are offered. Call the concierge at 719-477-2102 to make reservations. Take a journey through Christmas in Ireland and celebrate the great tradition of butter making, chase the wren on St. Stephen’s day, draw down the half door for spectacular dance, enjoy superb music-making, singing of Christmas carols and great storytelling in an unforgettable Irish night. Irish folk theatre at its best! This joyful night brings you to a wonderful Ireland that echoes so forcefully in millions of hearts throughout the world. Tuesday, December 1, 2015 at 7:00 pm Tickets $25-$35 plus fees at www.PikesPeakCenter.com, Direct: http://ev8.evenue.net/cgibin/ncommerce3/SEGetEventInfo?ticketCode=GS:WAPP:CPPC15:CPPC1201:&linkID=twmt-wapp , all TicketsWest locations by dialing 520-SHOW, or by visiting the Broadmoor World Arena or Pikes Peak Center Box Offices. Pre-event dinners in the elegant ANB room at the Pikes Peak Center are offered. Call the concierge at 719-477-2102 to make reservations. Irish Christmas is scheduled to perform also at Paramount Theatre on Wednesday, December 2, 2015. Showtime is 8:00PM. Doors will open at 7:00PM. Tickets are priced at $64.50 plus fees. Tickets are available for purchase at AltitudeTickets.com or by calling 866.461.6556. Michael Collins Pipes and Drums was founded in 1996 by a few talented musicians with a love of Irish music. With a home in the legendary Sheabeen Pub in Aurora, the members chose the name to honor the “Big Fellow” from Cork and Denver’s Michael Collins Division of the Ancient Order of Hibernians. The band’s objectives are to uphold the history and tradition of Irish bagpiping, play great Celtic Music, entertain the public and most importantly, to have fun while doing it. From a humble start as a small performance pub band, it has led the St. Patrick’s Day parade for the past 16 years, appeared on stage with the Jefferson Symphony Orchestra, Seven Nations, the Elders and the Chieftains and become an accomplished competition pipe band as evidenced by first place finishes at this year’s Pikes Peak Celtic, Colorado Irish and Long’s Peak Scottish-Irish Festivals in Quick March Medley and two firsts and a second in the Timed Medley. The true recognition of the bands’ accomplishments, however, lies in the invitation that has been extended to it by the Cuman Éire-Gaelach (the Irish Cultural Society) to march in next year’s parade in Dublin in honor of the 100th Anniversary of the 1916 Proclamation (the Republic of Ireland’s Declaration of Independence). The parade route on the streets of Dublin will go from St. Stephen’s Green down Grafton Street to the General Post Office on O’Connell, passing many historic sites significant to the events of 1916. Among the goals of the parade are the honoring of the patriots of 1916, recognition of the centenary of the Easter Rising and showcasing the heritage of bagpipe playing in Ireland. The latter goal having a consonance with the band’s reason for being creates a lovely symmetry that the band intends to acknowledge by accepting the invitation and going to Dublin next Easter. Such a trip, however is not inexpensive and the band, a 501(c)(3) private not-for-profit organization, is seeking help from donors and sponsors for the trip to help with travel, lodging, equipment, uniforms and all the trappings necessary to properly represent Denver. Different levels of sponsorship earn different sorts of recognition and acknowledgement. For more information about how to make a tax-deductible donation you can go to the bands’ website at www.michaelcollinspb.com, send a check to the Michael Collins Pipes and Drums Band, P.O. Box 16868, Denver, CO 80216, make a PayPal donation through their Facebook page or come to one of their pub fund-raising events, the next of which will be in the Sheabeen Irish Pub, 2300 S. Chambers Rd. (Iliff and Chambers) in Aurora on November 28th at 7:30 PM with special guest stars The Juice O’the Barley. Boulder Session’s New CD “Next Sunday at Conor’s ” Release Party Nov 15. Just as the CDs from 2006 are about to become rare items, there’s a brand new release, called “Next Sunday at Conor’s”. The eighteen tracks of tunes and songs represent the music of the current steady participants who meet every Sunday, 7:00 PM (Irish time). As on the preceding album, they transplanted to a studio, where pub noise (or ambiance, if you prefer,) doesn’t color the quality of the playing, and you can hear all the lyrics. 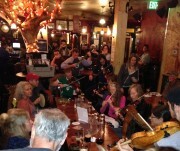 The Boulder Irish Session invites you to the official release party at Conor’s on November 15. All are welcome to join the celebration! The Boulder Session is the longest continuously running session in the area, almost 30 years now. A number of bands have spun off from this incubator, and musicians’ careers have been nurtured and enriched in our community. The repertoire is constantly changing and growing. Needless to say, there’s a lot of fun to be had! There’s usually an appreciative audience, including a number of regulars over the years, and room for you. The session is a way station, if not a destination, for traditional musicians from around the country (and beyond) who drop in when they can. At the Session tunes outnumber the songs. It is an open session, and a great one for musicians who have some repertoire and familiarity with the genre. Also a great place for beginners to meet more advanced players, pick up tunes and inspiration. For more information, people can call the session anchor, Michael Reshetnik, at 720-350-5277. The CD will be available at Conor O’Neill’s traditional Irish Pub, 1922 13th Street Boulder, during Sunday evening sessions, beginning November 15. On November 14th, 2015 a spectacular showing featuring hundreds of local, national, and international performers will be coming back to the Broadmoor World Arena in Colorado Springs for its second year. The show will draw in thousands of spectators along with military, civilian, and first responder performances to the city. The Colorado Military Taptoo is a patriotic, entertaining, and inspiring show that will feature over 400 performers including military bands, bagpipe bands, choirs, and other unique performance groups from the world over, in the two hour fast paced extravaganza. The show will be lit with vibrantly colored lighting and hundreds of performers will move, dance, and interact with the always changing arena floor. International Taptoos are based on a centuries-old military tradition and are produced all over the world. The largest in the United States is located in Norfolk, Virginia. Colorado Springs’ strong military presence and the amazing work of our emergency personnel make this city the perfect home for such a show. The Colorado Military Taptoo is a Colorado non-profit in conjunction with the Pikes Peak Community Foundation with support from the City of Colorado Springs. If you’d like more information about the Colorado Military Taptoo please call Joseph Poch at 719-635-8803, or email at j.poch@innomoments.com. Clark is an archaeologist and historian who has been the head guide at sacred ancient and historic sites in Ireland, including of the Hill of Tara and Newgrange in County Meath. An advocate for the environment through what he terms eco-spirituality, Clark has studied geology, botany and zoology and worked in the mining industry. 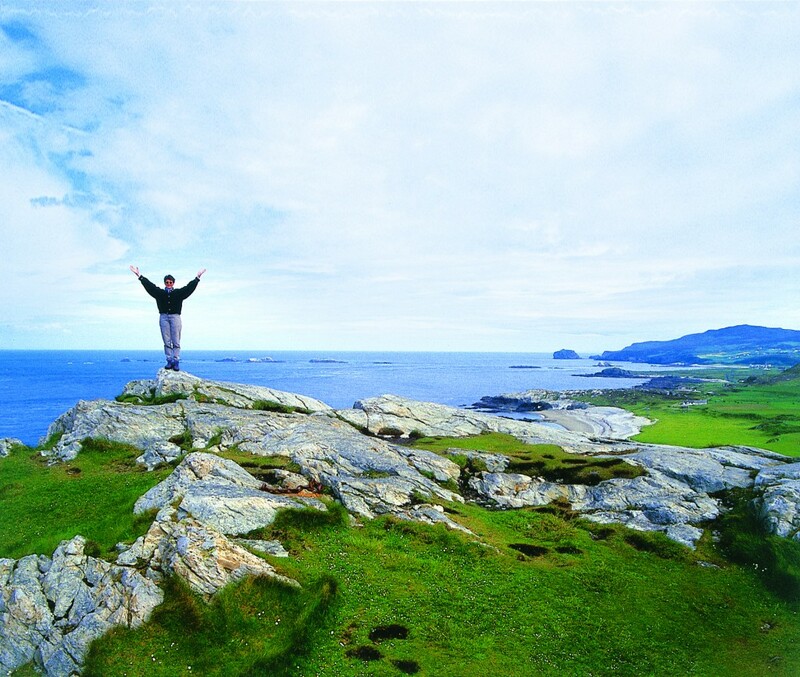 He is also a pilgrim guide, leading tours in the footsteps of St. Columban, an Irish missionary who travelled extensively in medieval Europe. 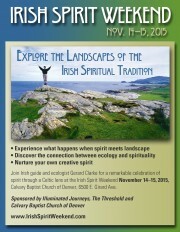 “Ger will take us on a remarkable celebration of spirit through the Celtic lens,” said Brad Berglund, founder of Illuminated Journeys, which leads pilgrimages to Ireland, Scotland, Wales, France and Spain. “We’ll also mine the spiritual gems of Irish language, music and folklore,” Berglund said. Or Contact Charlotte Million, 720-480-6168. Gábor introduces a bright light in fellow compatriot and cellist István Várdai winner of the prestigious Prix Montblanc. Vardai performs Haydn’s long-lost C major Concerto, full of fire and spirit and only re-discovered in 1961. Bach’s Cello Concerto in A is a real gem. Pulsing rhythms and a wealth of dynamic contrasts grab and sustain the listener throughout. Haydn’s emotive Symphony No. 52 in C minor plays directly to the Irish Chamber Orchestra’s strengths with its eruptive moods and jagged rhythms. Finally, Bartók’s Divertimento is one of his most soulful and poetic creations. The ICO endow their sound with a sense of fullness and wealth which makes the whole thing a joy. Virtuoso violinist-turned-conductor Gábor Takacs-Nagy founded the celebrated Takács Quartet and is Principal Artistic Partner of the Irish Chamber Orchestra. He is music director of Manchester Camerata, guest conductor of the Hungarian State Symphony Orchestra, the Budapest Symphony Orchestra and more. Don’t miss the Irish Chamber Orchestra at venues in Colorado and New Mexico. The Irish Chamber Orchestra is resident at the Irish World Academy of Music and Dance at the University of Limerick and is funded by The Arts Council Ireland/An Chomhairle Ealaíon.